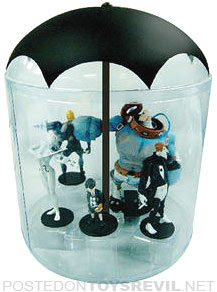 Further to my earlier SDCC-post (and video of prototypes) about Dark Horse's PVC figures based on characters from the Gerard Way-written / Gabriel Ba-illustrated THE UMBRELLA ACADEMY [wiki] has been scheduled for an April 15th 2009-drop. It's pretty good comic. I was especially impressed after reading it found some emo band guy wrote it.